Since its inception in 1988, Adams County Habitat for Humanity has helped provide 32 homes to low-income families deserving of home ownership. Partner families invest up to 500 hours of “sweat equity” in their homes, working alongside community volunteers and skilled laborers who often donate their services in order to construct or rehabilitate the homes. 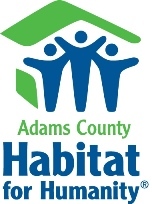 The Adams County chapter is one of 1,500 affiliate chapters throughout the U.S. and one of 2,050 Habitat for Humanity chapters world-wide. This nonprofit, ecumenical Christian housing ministry has provided more than 600,000 affordable houses to more than 3 million people since being founded by Millard and Linda Fuller in 1976. More than 300 volunteers spent nearly 1,500 hours working on Habitat homes in Adams County in 2012. Hundreds of additional hours are donated to the organization annually through the work of board members. The organization is run entirely by volunteers.